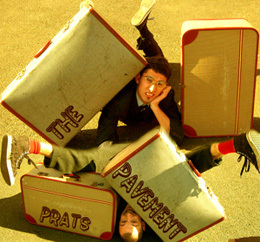 The Prat Brothers and their innocent looking suitcases dish out a mix of physical frolics, mind blowing magic, dare devil escapology and a topping of tummy clutching crunch. In real terms the Brothers are ready to hit the ground running and set up time is minimal. The magic stands up as the real thing...The twist? The explanation and the volunteer participation! Straight jackets, sword swallowing, and a splash of lycra seal the deal! Available as a 30 minute static show. Suitable indoors and out. A self-contained fun for all the family show. There’s Hook-a-Duck, Splat the Love Rat, a Coconut Very-Shy and even the good old Tin Can Alley. But watch the Prat Brothers carefully- this show has a well-earned reputation for not being all that it seems and Funfair Games is only one consonant away from being Unfair Games! With Joel Prat’s legendary slight of hand and Kyle Prat’s physical pratting the audience will play hard, laugh loud and have to expect the unexpected in order to win their prizes. Even the traditional ‘goldfish in a bag’ is not all that it appears to be; have you ever seen a goldfish squirt water and squeak like a mouse? Please note, there are no live creatures in this show, apart from the Prat Brothers themselves. The Prat Brothers adhere faithfully to the golden rules of theatre and never work with real animals. Kyle Prat combines physical comedy, highly skilled juggling, ball spinning and his own witty repartee in one show-stopping show. No one is allowed to leave without a belly laugh (included in the booking fee). A trumpet fanfare, a flick of the wrist and a clever spontaneous approach catch and conquer audiences. See if the boule balls of bewilderment can get the better of the man when he attempts to juggle them! Watch balls balance and spin, diablos fling and be amused at Kyle’s expense. 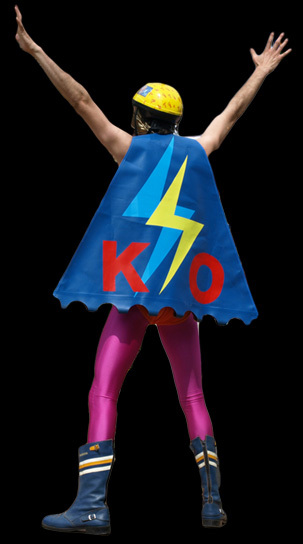 In the build up to the finale, Kyle enlists a member of the audience to help him fulfil his life-time dream and, in SuperPrat costume, he attempts to complete the dangerous walk of death, juggling knives over a helpless… er… helpful volunteer. Unfortunately, the knives have been switched for other, less daring kitchen equipment; the walk of death becomes less deathly walk and more rollicking saunter, with an added spatula of silly suspense. Lasting approximately 30 minutes, this timeless (er, well 30 minutes as I’ve just said!) yet family friendly performance is suitable for festivals, corporate events and more intimate venues. We are talking classic clowning with a totally mirthful modern spin! 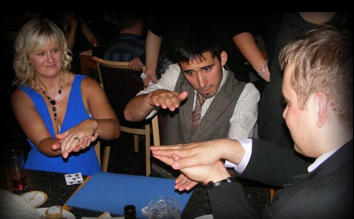 Click Here to find out about Joel’s solo magic shows and for contact details. These are static performances of comedy theatre, where the performer and the audience share the same space. The shows are suitable for indoor and outdoor events, ideally a minimum space of 5m x 4m and room for an audience! Please let us know if the performance area will be smaller than this! Height requirement for juggling, 3m. The show usually lasts between 30 to 45 minutes depending on your requirements. Vehicle access to the venue or a suitable parking space is needed for the movement of props and costumes. If this is a problem, secure changing and storage facilities, with a loo, are needed.